Most hams who know me, know that I love to tinker and work on projects. Sometimes they even work out in the end. So begins this one. I’m an avid follower of the Soldersmoke podcast and website. Bill Meara N2CQR and Pete Juliano N6QW host a monthly podcast all about QRP and radio homebrew. Their inspiration has given me the courage to begin and successfully complete several projects. The Michigan Mighty Mite is a good example. One of their homebrew heroes is Ashhar Farhan VU2ESE who invented the BITX transceiver 14 years ago. Last year they reported that he’s selling the board fully constructed and tested. All you need to do is find a suitable enclosure and attach the peripherals. At the $45 price point it’s hard to beat as a development platform. The basic radio can be upgraded to stabilize the analog VFO or even improved by adding a DDS or PLL VFO quite easily. Low pass output filters can be added to take it from a 40m monobander to all band operation. I couldn’t resist! With the circuit fully complete, this amounted to a one day project to get the basic assembly done. I found a suitable Christmas tin for a cabinet. The majority of my time was spent laying out and marking holes for the board standoffs and all the jacks and pots to be connected. It’s not exceedingly elegant but I was able to accomplish it all with a hand drill, pliars, and a couple wrenches. I chose the metal enclosure because I thought It might provide good shielding. Eventually I’ll probably add a small fan and punch some holes for ventilation. There should also be enough room to add an Arduino, DDS or PLL board, and cool LCD display. I think it would make a perfect radio for portable operation with a battery and 40m dipole at the park. instructions, reference materials, and purchase info. The product is sourced and shipped out of India and constructed by a local women’s collective that helps provide skills and jobs. They typically arrive in less than a month. Not bad turn around time. Easy ordering with Paypal. So here it is with a couple knobs out of the junk drawer. I trialed it on the bench and it plays great, minus the drift. Even that settles down after about 15 minutes. Crisp, clear analog audio…but you have to ride the AF gain what for having no AGC. I bet you could probably hack that into the circuit pretty easy, too. I could generally hear just about anything I could copy on the Flex-5000, so that says something about the sensitivity. This was a fun and functional one day project with only minimal soldering required. Looking forward to doing some more hacking on this one! Will try to produce a companion post with a little video production for everyone playing along at home. 73 all. The cold winter months are good for spending time in the radio shack, and also in a comfy chair doing a bit of reading. I just finished reading this book and thought I’d write up a little review to share with my blog followers. 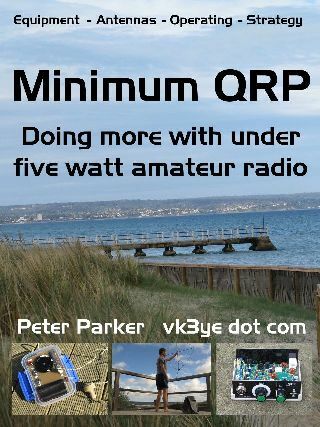 Minimum QRP is written by Peter Parker VK3YE. 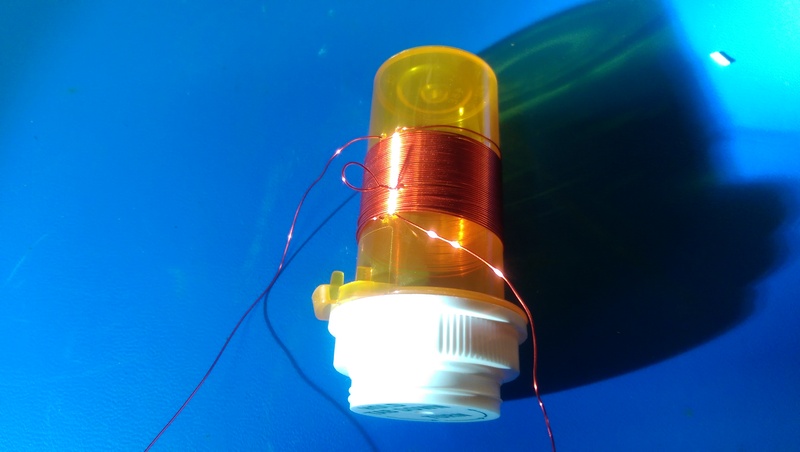 Many followers of Soldersmoke and youtube will recognize Peter from his many videos on low power operation, pedestrian mobile, and homebrew electronics. In his book, Peter covers all aspects of low power operation from radio, to antenna, to operating location, and even strategies for successful operation and maximizing the chances of making contacts. He covers HF/VHF/UHF, both terrestrial and satellite. It’s impossible to cover everything QRP in great deal, but this book offers a lot of great info on the subject. I don’t really consider myself a QRP aficionado but I found the book quite enjoyable. It’s easy to read and not overly technical in any way. If nothing else, it offers a great deal of encouragement and support to people interested in pursuing low power operation. At $5 via Amazon Kindle it’s hard to argue with the price. I’ve certainly wasted more money on useless items! Well, the HV power supply seems to be humming along nicely. The meter on the control head displays 2500 VDC which is probably about right considering my line voltage in the shack (248 VAC). 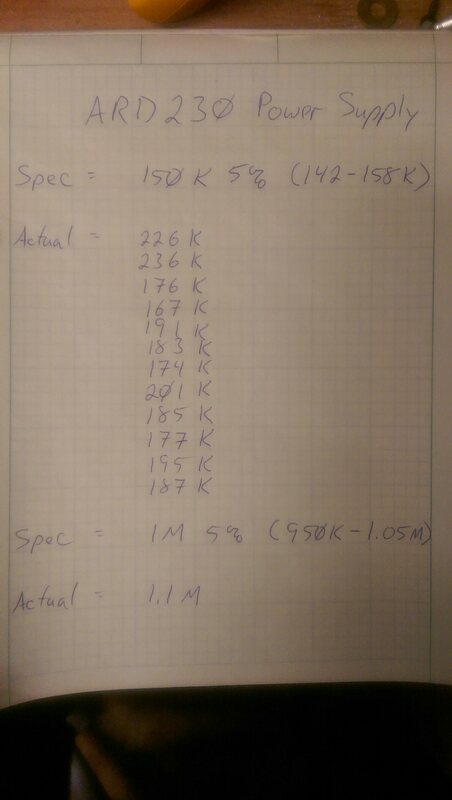 As promised, I measured all the resistors that were removed from the supply and noted their values. I also noted their specified range based on the five percent tolerance value. As expected, not a one was in spec. I’m not sure that this really makes much difference as the power supply isn’t exactly a calibrated circuit, but it would be silly not to replace them while refurbing the supply. They’re inexpensive and easy to replace. I substituted metal film resistors of the same value and power rating rather than the original carbon composition. I haven’t had a single issue at all with breakers tripping on the amp or sub panel since making the repairs. I’ll conclude that it was definitely a faulty filter cap (or maybe several). It uses six 240 uF 450V computer grade electrolytics in series for a total of 40 uF DC filtering goodness. I don’t have a way to test them at this time to determine their values. Actually, I don’t even have them anymore. The neighbor kid (Jacob KC9ZYV) wanted them (and also the caps from the Amp Supply LK-500 NT power supply I refurbed last year). He mentioned something about a rail gun…future mad scientist at work! I recorded the values for everyone on a pad of genuine Purdue green engineering graph paper. I still have nearly a full pad of this stuff after nearly 20 years. I wasn’t an engineering student! I hope you all find the info interesting. The next order of business for the amp is to synch the DC drive system with the Tune and Load air variable caps in the RF deck. Then I can calibrate them all for roughly every 100 KHz of each band and let the amp auto tune itself! 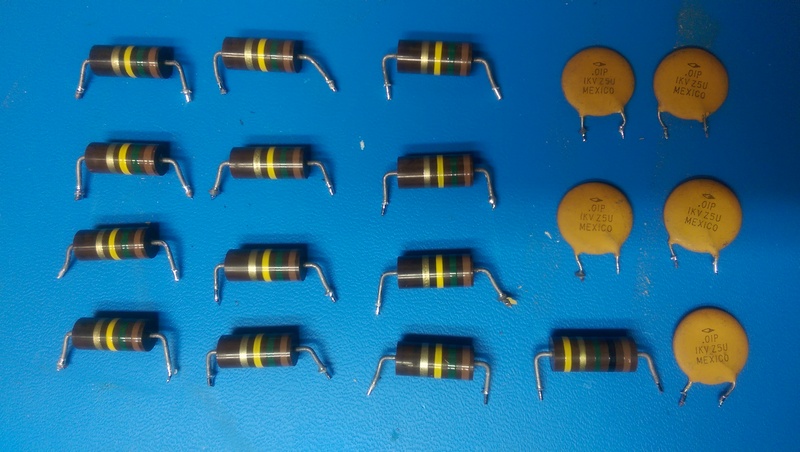 Check out how far some of the resistor values have changed. Another phase in the amplifier rebuild is now complete. Thanks to the large chassis I was able to remove the transformer and HV power supply with little effort. It’s a lot lighter with that monster Peter Dahl hypersil removed. Only a moderate amount of contortion was required to extricate the power supply assembly through the bottom opening. The rebuild went pretty straight forward. Fortunately, power supplies are not incredibly complicated beasts. The main issue I had was a couple traces came loose from the circuit board as I was de-soldering. Thankfully, I was able to get them all back down into position when the new components were installed. The solder is holding them in place. Grungy bits removed from circuit board. Components removed were: six 240 uF computer grade electrolytics, twelve 150K 2W resistors, one 1M 2W resistor, and five .01 uF disk caps. The other components looked to be in pretty good shape. The board was pretty grungy so I took some time to wipe it all down with alcohol before soldering it back together. I made only one component substitution. 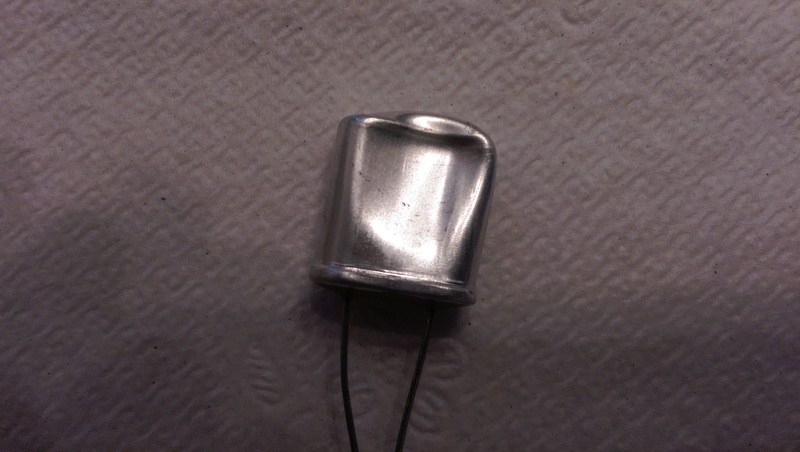 The original carbon composition resistors were replaced with metal film resistors of the same value and power rating. The HV power supply is designed to provide 2300 VDC at 1.0 A. 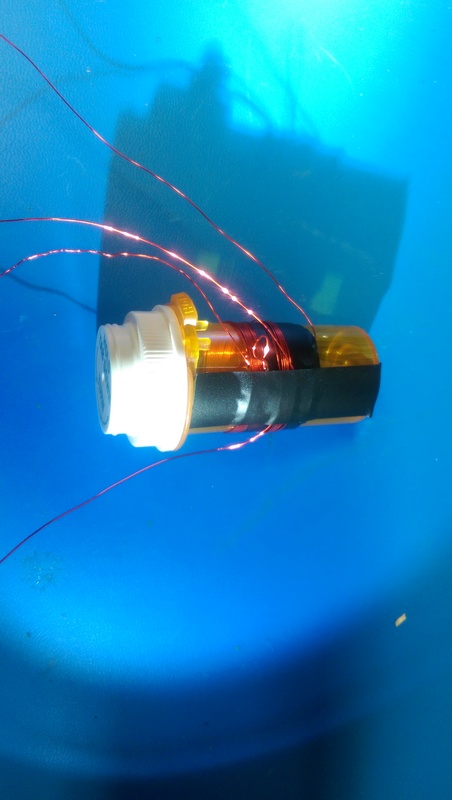 There is a total of 40 uF of capacitance for filtering the DC. My original problem was the circuit breaker on the chassis and/or the circuit breaker in the sub panel would trip when I powered up the amp. This would happen either right after the power switch was flipped or as the step-start circuit dropped out. On occasional times when it didn’t trip, it would run for some time and then trip suddenly. This was especially annoying! I’m pleased to report I’ve successfully tested the supply several times now and it seems to be working great. The meter on the control head shows a steady 2500 VDC. Initial load testing with low drive (up to 35 W) has provided up to 700 W out into the dummy load. If everything proves to be linear, as it should be, then I should easily see legal limit with under 100 W drive from the exciter (in this case a Flex-5000A). This is also without getting Plate and Load caps fully peaked in manual tune mode. The gear motor drives are not properly synced right now. They should be turning from 0-180 degrees as shown on the control head indicator. Right now one is and the other just moves from roughly half-meshed to half-meshed on the other side, never getting fully meshed. Getting them properly adjusted will be my next project. This portion will switch from electrical to mechanical technique. Good thing I do this kind of stuff in the real world!